I think it had been years since I last posted at here, but I got something I want to present. 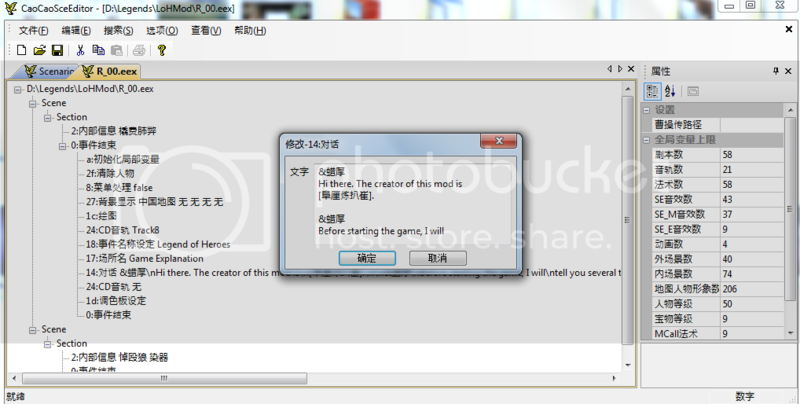 This is Legend of Heroes mod based on New Legend of Cao Cao by [막장조건달]. 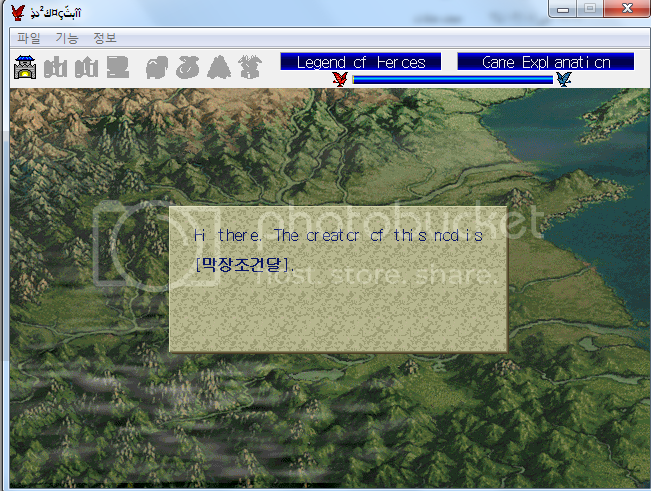 The original mod is based in Korean and I have been translating it to English. I finished until the end of Battle of Jieqiao with Yuan Shao, and I definitely need some help to get into more complicated stuffs. 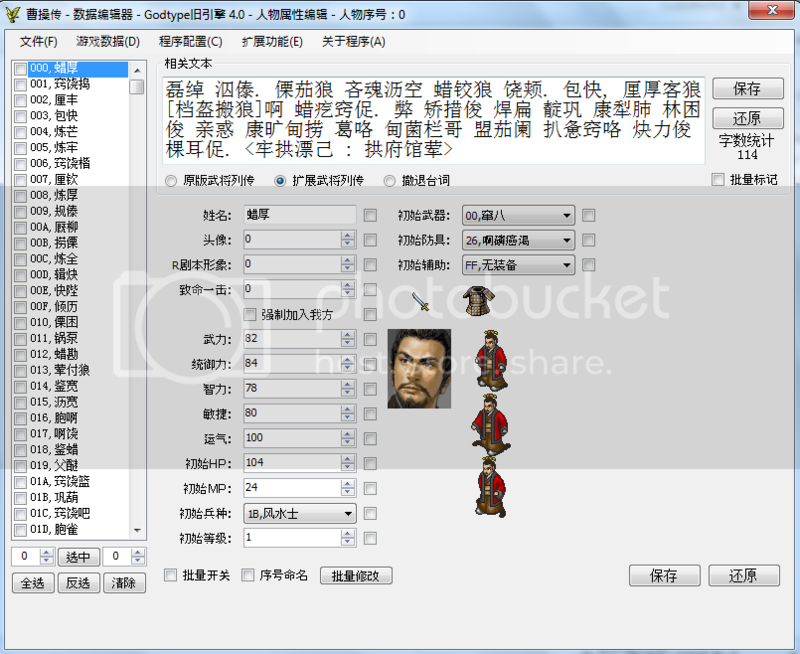 What I know how to do is translate the scripts and change enemy levels/equipments. I can also change events and scenes, and I cut some of the unnecessary events which wasn't present in the original. But I still don't know how to get into program and translate the GUI itself, so definitely I have to get a lot of help how to do so since English LoCC was from here. Since I am not Chinese, I need to know some of the Chinese pronunciations on some of the generals and locations, such as Bun Gung (fighter at Chunyu Qiong battle), Kwangchun (where you battle Pang Ji). Also, the creator of this mod put some forced difficulty which I found unnatural compared to the original game, so I plan to adjust it to the difficulty of the original. So I need your help testing it and give me your feedback about translation and difficulty. Again, I didn't create this, so every credit goes to [막장조건달]. I got some notices about save files not working. I heard installing Asian IME fixed the problem, so try it if you have that problem. Update: I will have to describe some untranslated bits for story. I managed to work until Battle of Yangping Pass (end of act 3), and there will be times that Liu Bei has to move around cities. These are names of the cities you have to visit so far, so know these. And some names/locations I haven't followed in Chinese I need some Chinese speakers to tell me about how to put these in English: Bun Gung (fighter), Kwangchun (Qu Yi battle), Hagu (Dong Liang/Zhang Liao battle), Pengsung (Zhao Ha/Gao Shun battle). 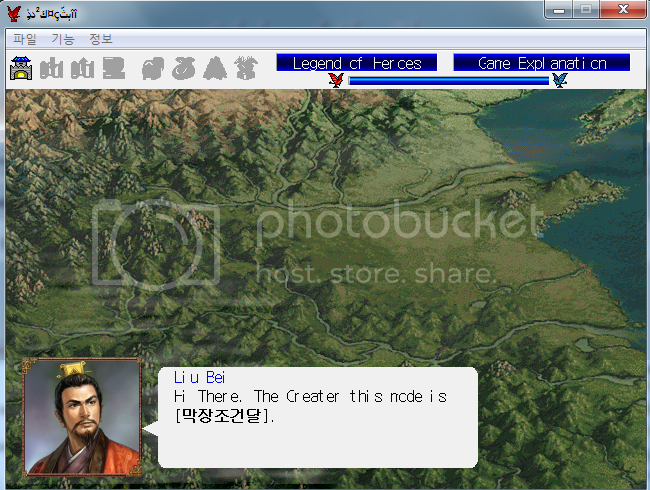 The blue spell Liu Bei learns around Lv. 10 is called 정진. And what it does is double the exp of equipments of the target general during the buff duration. Very important spell and can be abused to make the game much easier. I got some message from my play tester that Battle of Xiapi (Lu Bu) makes the game glitched and creates errors in save files. I have tested in many times but still haven't found out about the problem. So tell me whether it happens to you, and make sure to back up your save files before you go to Battle of Xiapi (*.e5s files). In addition, playing that stage without reloading might help because those problems might arise from loading from what I heard. Again, please give me your feedback about the translation and difficulty. Last edited by waZup on Fri May 16, 2014 5:26 pm, edited 4 times in total. That looks like an interesting mod! It looks like this has RPG elements in it like the original LoH and in the Mount Wagang mod, which is exciting. Could you provide a link to where this mod was originally posted (even if it's in Korean)? I'm wondering about the Chinese characters in the program name--was this mod originally created in Korean or was it a translation from a Chinese mod? The GUI is all in the exe file (ekd5.exe in the original LoCC). A tool such as eXeScope or Resource Hacker will be able to help you translate the windows and import some icons (such as the "buy/sell/equip" logos). After that, you'll need a hex editor like UltraEdit to change the remaining text. Supposedly there are other hex editors that can do the job, but I've only been able to make UE decode the Chinese characters properly. I'm a bit uneasy about what you said regarding deleting scenes and modifying the difficulty. Have you talked to the original author about doing this in the translation? I don't know what the Korean modding scene is like, but in the Chinese modding community, it is really frowned upon to change things in another person's mod and distributing it. It would be like misrepresenting another person's work. There must be a reason why the original author decided to include those scenes and difficulty levels, so if you change them, you're not really presenting what the original author intended. This is where the file originated from. 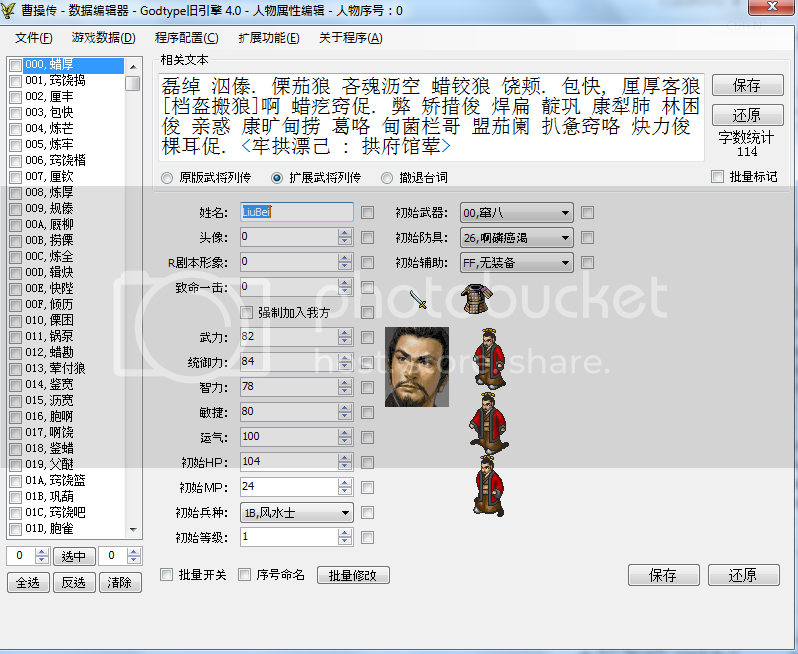 Korean LoCC also has the Chinese character on the top GUI, but like the explanation, it uses New Legend of Cao Cao engine, which is originally Chinese. However, the creator is Korean and what what I am doing is to adjust it more wider audience. Last edited by waZup on Wed May 29, 2013 8:34 pm, edited 2 times in total. What I cut from the remake is at the beginning where Liu Bei has to duel Yuan Shu to convince him about taking charge of Sishui battle. But what I saw from this was people getting turned off (you will see what I mean if you try the original remake there) because it was something the creator put, and didn't follow the original story. Another thing I took off was duel scene between Wen Chou and Gongsun Zan, because players have to see three duels in a row with Wen Chou just to play the Jiaqiao stage. But I never touched other scenes/additions except those two and will continue to so if they don't affect the gameplay much. About the difficulty, I tested the game before and it feels very unnatural after the first Xuzhou stage. Basically, you have to keep save and load for the chances for your guys to land a critical hit or attack consecutively, and every single of Cao Cao's generals are equipped with the same collectables to increase this "forced" difficulty. It's pretty much impossible even for me to clear the stages without saving and loading like I did with the original. So I plan to balance it through changing levels and those equipments combos. I know changing much may disrespect the original work. So I plan to do as little as possible and if I have to do it, it would be only for the better. Maybe I should write a disclaimer that it was further modified and doesn't guarantee 100% of the original mod. Thanks for the advise though. Last edited by waZup on Wed May 29, 2013 8:35 pm, edited 1 time in total. After the battle of jiaoqiao, all the dialogue is still in chinese. Does it mean the translation is still far from finished? Yes, it is still at work. It's not Chinese, but made by Korean and I am translating it into English. I posted this just as kinda demo thing, and right now, I finished it until Cao Cao retreated from Xuzhou. You Ask how To Edit The Names Right? Wow, thanks a lot. I do have CaoCaoSceEditor, but not CczEditor. So can you please give me a link where I can get it? I will do my best with this project, so please give me feedback and advises as I go. PS. There is even Legend of Kongming remake released at Korean cafe just few days ago. I will also work on that after this is finished.